Amazon asked an online forum to remove links to software that lets people load ebooks they buy from sources other than Amazon onto their Kindles. The MobileRead forum removed references to the software but doesn't believe the program violates the Digital Millennium Copyright Act, as Amazon charges. 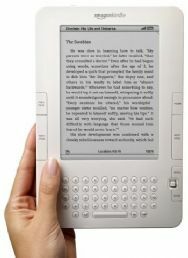 Amazon introduced the second version of the Kindle in February. The devices are wirelessly tied to the Amazon store, where users can buy books, newspapers, magazines and other content. Users are restricted from loading ebooks that they buy from other sources onto the Kindle. MobileRead had offered instructions about how to use a small script called kindlepid.py that the site didn't host but directed readers to. The script lets users of Kindles discover their device's personal ID. Many ebook sellers require the PID, but Amazon does not disclose the PID to Kindle owners, according to the instructions that were posted on MobileRead. Armed with their PID, a user can buy an ebook on a site other than Amazon and the book will display on their Kindle. Users can also download books to their Kindle from some public libraries, many of which now offer digital books. "Although we never hosted this tool (contrary to their claim), nor believe that this tool is used to remove technological measures (contrary to their claim), we decided, due to the vagueness of the DMCA law and our intention to remain in good relation with Amazon, to voluntarily follow their request and remove links and detailed instructions related to it," wrote Alexander Turcic, a forum moderator, on MobileRead. Amazon's letter, which MobileRead has posted, implies that the software lets users circumvent DRM software. "At the above-mentioned URLs, there is computer code and instructions that purportedly allow removal of technological protections that prevent copyright infringement," the letter reads, after listing several links to pages on MobileRead. MobileRead has removed the pages, which are still available through Google's cache. As many people commenting on the MobileRead post note, kindlepid.py is still widely available on many Web sites. It was first posted by its creator, Igor Skochinsky, in late 2007. Other people posted comments on the forum expressing their disappointment at what they regard as an attack by Amazon on its customers. "What this script does is make the Kindle more useful. With Amazon using the DMCA to get rid of this, they are alienating their customers and causing prospective customers to purchase a different device," a forum member called Jon wrote. In addition to using the program to load non-Amazon ebooks onto the Kindle, users can buy ebooks from Amazon purportedly for their iPhones but transfer them onto readers other than the Kindle. Users of the iPhone application are supposed to be able to only transfer books to Kindles. Amazon did not reply to a request for further comment.